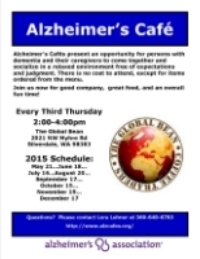 Alzheimer's Cafes present an opportunity for persons with dementia, caregivers, family and friends to come together and socialize in a relaxed environment free of expectations and judgement. Just companionship, great food and fun. 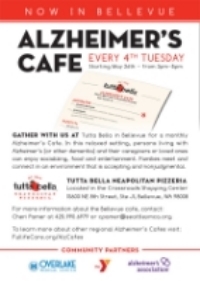 Currently there are five Alzheimer's Cafes in Seattle as well as in Bellevue, Edmonds, Gig Harbor, Marysville, Mercer Island, Silverdale, Tacoma and Tumwater. To learn about when and where these Cafes take place, take a look at the Momentia Calendar or click here for a complete list.